Home / TallyERP.9 Lessons / How to Export Data from Tally? How to Export Data from Tally? 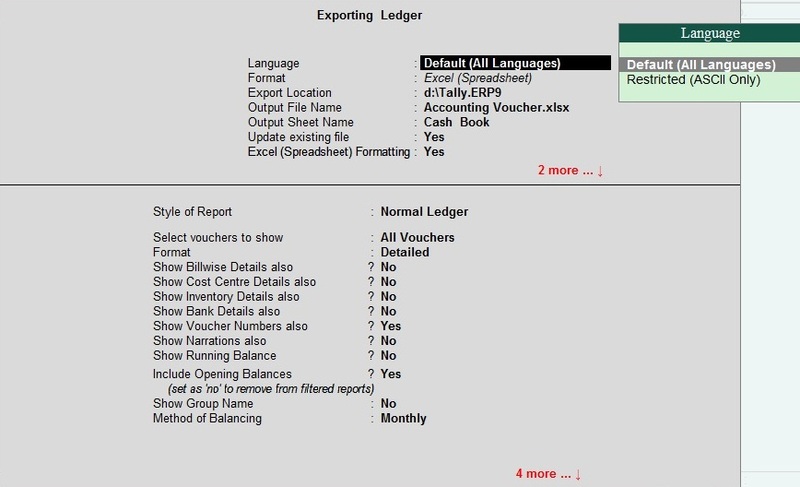 Do you know Tally export your data in six formats i.e. ASCII Comma Delimited (txt), Excel Spread Sheet, HTML, JPEG Image Format, PDF (Portable Document Format) and xml (Data interchange). For Exporting Data, It is very easy. Export option is appear top of the tally screen just besides Print Option. When you Click on Export or Press Alt + E, export window will appear on your screen with some predefined formats. But remember when you export a report then window will show different options and when you export a voucher then export options are different. Above image is ledger level export option showing multiple options like style of report, format detailed or condensed, billwise details, cost center details, inventory etc. Above image for voucher level export option. You can use this option only for export voucher. You can also export your sales invoice in various data format. Best option for export a report is pdf and if you want to make extra calculation in your working then you need to export data in excel. Tally Export the data by default in Tally Installation folder and you can change the export location by change in Tally.ini file allocated in Tally Installation Folder and change the Export location directly on export option screen.